Handicap Server supports a large number of handicap methods, ranging from well known methods (such as the North American Method) to methods that can be highly customized (such as the Advanced Handicap method). Each group of golfers is different, and we encourage everyone to experiment and choose the best fit. At the same time, we are always on the lookout for new handicap methods, so please contact us if you are using a handicap method that is currently not supported. To modify the handicap settings, you will need to click on Settings > Handicap. The Handicap option allows you to select your desired handicap method. We are currently offering 6 different handicaping methods: USGA Method, Rolling Average, Weighted Average, Average All, Edward Method and Advanced. After choosing which one you want to use, we will allow you to set up additional options if available. 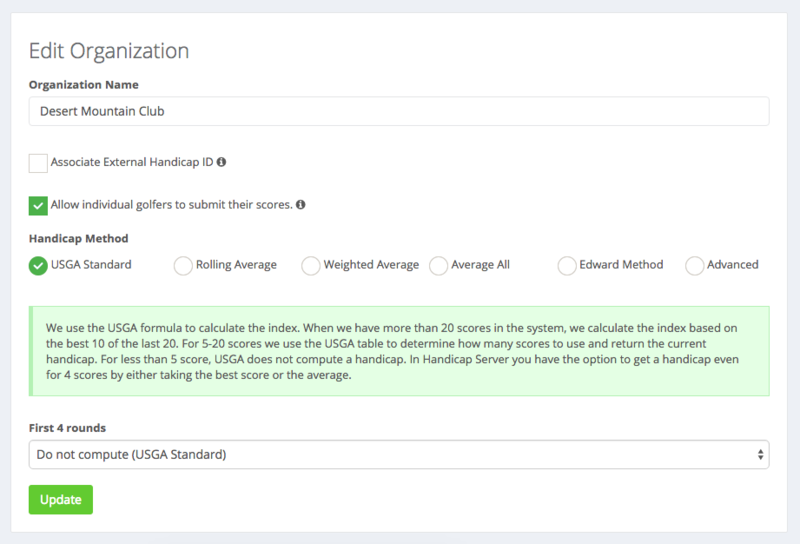 The use of USGA Method formula happens when we have to calculate the golf handicap. The first step is to get an Adjust Gross Score. In order to do this we have to use Equitable Stroke Control(ESC) which avoids recording a very high score on an individual hole. The purpose of using ESC it's to adjust downwardly the individual hole scores to represent more a golfer's ability of playing. ESC gives us the maximum number of strokes that can be entered in a given hole. We use a standard table to determine how many scores to use and return the current handicap. The second step is to calculate a Handicap Differential. First we have to get the difference result between our Adjusted Gross Score and Course Rating. Than multiplying this result with 113 and dividing it by Slope Raiting. If we have more then 20 scores we have to look at the most recent 20 scores and took the best 10 scores and calculate the average. If we have have 10 scores we have to look at the best 3 scores and calculate the average. If we have 15 scores we have to look at the best 6 scores and calculate the average. In the fourth step we have to calculate the net Handicap Differential. In orded to do this we have to multiplying the Handicap Differential averages with 0.96. Our result will contain more digits. We have to delete them after tenths place. The last step is to calculate a Course Handicap. The Course Handicap is equal with the Slope Rating of Tee on Course dividing by 113 and multiplying this result with the golf handicap. In Handicap Server you have the option to get a handicap ever for 4 scores by either taking the best score or the average. You can choose this options below the "First 4 rounds" scroll box. The Rolling Average is similar with the USGA Method. The only difference between this two methods is when we calculate the differentials we have the option to choose the worst or the best scores. This method in Mathematics is a technique applied to time series data(such as golf scores) in order to make forecasts. 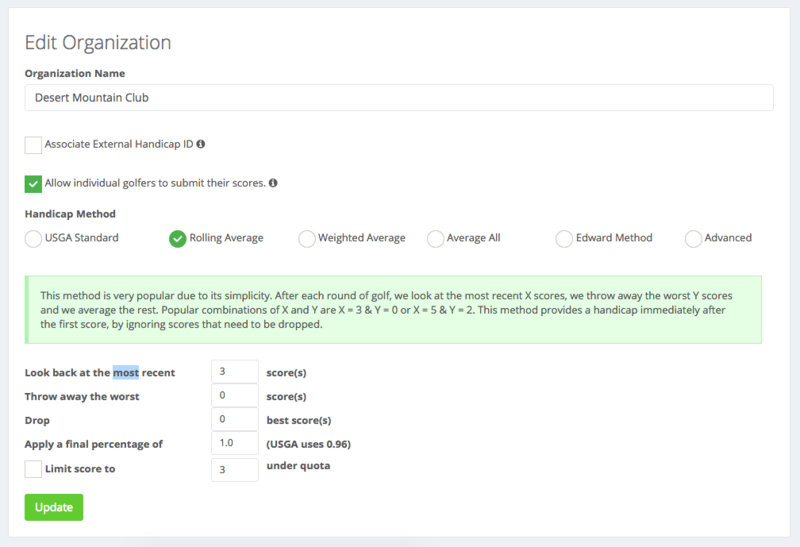 Your first handicap is the differential that is linked to the first score that you post. 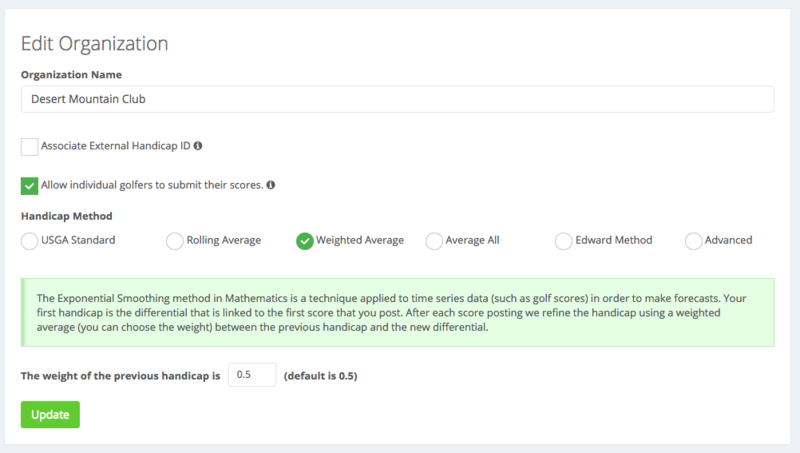 After each score posting we refine the handicap using a weighted average(you can choose the weight) between the previous handicap and the new differential. Simple method that computes the average of differentials if less than four scores introduced. If there are between 5-20 scores, we throw away the worst and the best differential then compute the averaged of those which remained. If there are more than 20 scores, we take last 20 and calculate the average as in the cases above. Edward Gobran is one of our clients who had a special method of handicap. For us it is a pleasure to be contacted by our clients with new ideas of handicap. We are very glad and thankful having him as a client. In his honor we named this method after his name. The Edward Method starts with an initial handicap for all players. 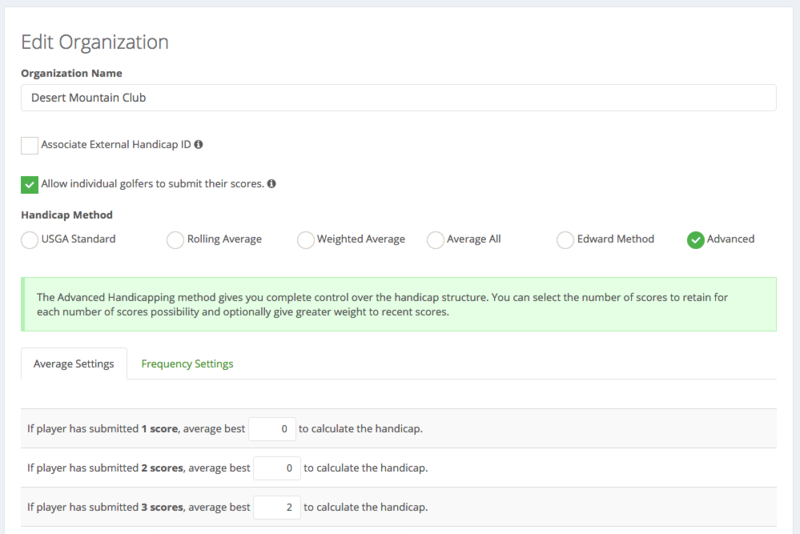 When the first score is registered, the new handicap is 1/4 of the score plus 3/4 of the initial handicap. The result is multiplies by 0.96, similar to the USGA Method method. The second score and beyond modifies the handicap as follows: 0.2 of the initial handicap plus 0.4 of the first score plus 0.4 of the second score. A 96 percentage is applied to the final result. It's the most generalized method, because we can adjust what happens with the handicap of a man from the moment when we receive the first score. A greater number entered in each box represents a lower tolerance for mistakes of that man. 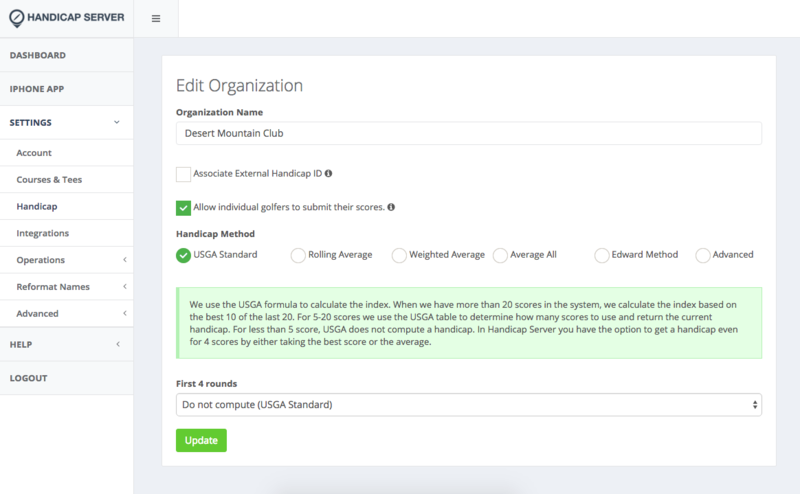 USGA Method recommendations are always on half the number of scores ( example: if player has submitted 10 scores, average five best scores). But it is a compromise between tolerance and accuracy. For accuracy and greater competitiveness, a higher number is better. The decision depends on us.